We don’t have TV here. But let’s say I’m willing to spring for a few bucks because someone is at my house who would like to watch the Yankees – Red Sox game on the Internet. Which is, after all, like a TV, right? So, great. I have FiOS Internet and phone from Verizon. They also offer TV through the same fiber. I know this because they offer it hard; and they offer it often. As it happens, earlier this evening I’d upgraded the FiOS Internet to higher speeds for just ten bucks, and I even got an email saying that my “request” was “complete,” even though the speeds still seem pretty much the same, but hey, that’s Verizon; you can’t really take them too literally, after all. They’re pretty much the government. But ok, whatever. Can I get the ball game or not? Interested in technology, brands, customer service, computers? 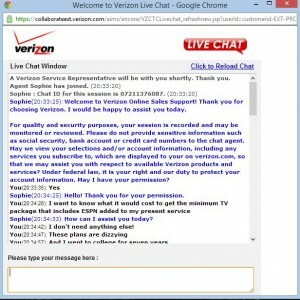 Then you’ll love my chat with Verizon (heads up, BTW; in the chat I got the up/down speeds scrambled).